This evening we decided to grill steaks for dinner. Hubby ran to the store and picked up a couple of filet mignon steaks that I lightly seasoned with Kosher salt and freshly ground black pepper before grilling them. I also sauteed some fresh sliced mushrooms to top my steak with (hubby is not a mushroom fan). For our sides, I made 2 different veggies. I halved some ripe cherry tomatoes and marinated them in extra virgin olive oil, pomegranate vinegar and salt and pepper. I also had a bag of rather large brussels sprouts that I wanted to make, so I looked for a different recipe to use them in. I found a delicious sounding recipe from Bon Appetit Magazine's November 2007 issue. It was for Brussels Sprout Hash w/ Caramelized Shallots and the recipe looked and sounded really good. It called for thinly sliced brussels sprouts that were cooked with caramelized shallots along with a little sugar and apple cider vinegar. I substituted 4 teaspoons of Swerve sweetener for the 4 teaspoons of sugar called for in the recipe. 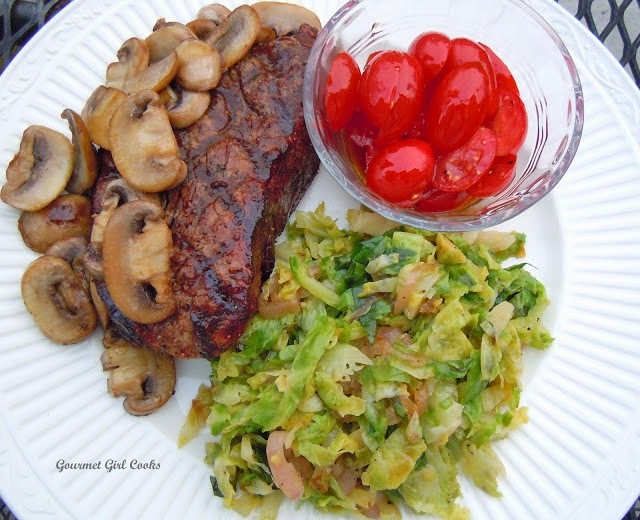 It turned out really good and it was a great way to use the larger brussels sprouts. 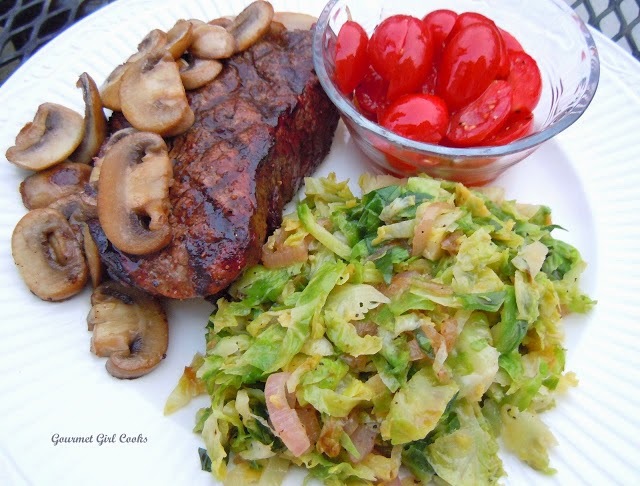 Below are a couple of pictures as well as the easy brussels sprout recipe from Bon Appetit. Enjoy!